Comment: Joshua tells the people to choose this day whom they will serve: the Lord or other gods. But before he lays out the choice for them to make, he reminds them of everything the Lord has done for them. Joshua retells the history of these people and their relationship with the Lord, from the time of Abraham beyond the Euphrates, through their time in Egypt, up to now as they prepare to enter the Promised Land. They are not just making a choice, they are choosing a way to live from now on—will they continue following the way of the Lord, the way they have followed so far? Their history reminds them of what is at stake in their decision. 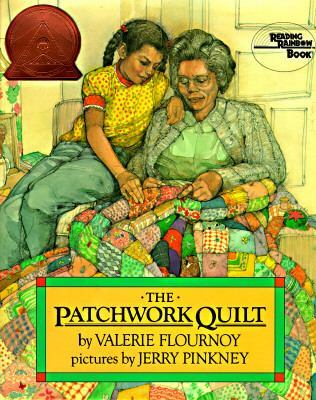 In The Patchwork Quilt, by Valerie Flournoy, Tanya learns about different ways of procuring a patchwork quilt. One way is to buy a quilt at a department store, where it can be purchased easily and acquired quickly. But the other is the way Tanya learns from her grandmother. This alternative is a way that is slower, more painstaking, but forms a bond between them, gives them shared memories, and leaves Tanya with a priceless gift. Tanya learns to make a quilt this way, and is able to continue her grandmother’s skills and gifts. She chooses the way of history, relationship and priceless treasure. Like the Israelites, we have a choice of whom we will serve and how we will live. We make that choice by remembering our history with the Lord and the Lord’s faithfulness, because we know those memories and that relationship are priceless treasures. We let that history, those memories, that relationship, guide us in the way we move forward. Thanks to Sara Anne Berger, pastor of First Presbyteria Church, Nachitoches, LA, for writing the Narrative Lectionary Links this year. Lectionary Links (NL): October 14, 2018 by Storypath is licensed under a Creative Commons Attribution-NonCommercial 4.0 International License.